The Questing Beast, the aid of any challenger, comes to us this week. After one testing week, we may have another. This week however, help is at hand. The Questing Beast heralded the start of the Grail Quest, before the vessels appeared in Camelot. We don’t know where the Grail ended up or even if it’s still in one piece, buried somewhere deep. 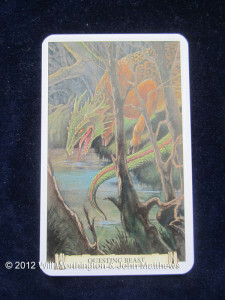 The Questing beast in this case might be metaphorical, it might be mental, paranormal. Life has a funny (and I don’t mean hilarious) way of testing us. Life, they say, is what happens when you leave your comfort zone. That might well be true, but sometimes and regularly, we need to be in the comfort zone for our own sanity. I had hoped to be back at that point this week; no such luck I fear. When we venture out, beyond that comfort zone, the Questing Beast is what we’re chasing. It can come to challenge us in many forms, testing our weak points, our strategy, our theories. It can make or break us, it can create situations that define us and if we conquer it, we can be like the two hero’s (Pellinore and Palamedes) from these tales that came close to defeating it. I find it ironic that these two strong, well equipped, armed men, could not catch the one thing that they set out to. Which is why I believe the Questing Beast is what ever testing situation we create for, or find ourselves in. Others contribute to these situations, but whatever these testing times are, we can learn from them. We can learn its wisdom simply by following it, even though its purpose remains hidden. What do you have to battle with this week? What is the testing situation you need the strength and wisdom from the Questing Beast? When did this testing situation begin? What makes you the most afraid? What are you really seeking? The Questing Beast has found us. How will you deal with the testing times ahead? Deck used was the Camelot Oracle, illustrated by Will Worthington, written by John Matthews.